It’s that time again! How fast a year goes. The date for our biggest annual event of the year is 29th July – 6th August. 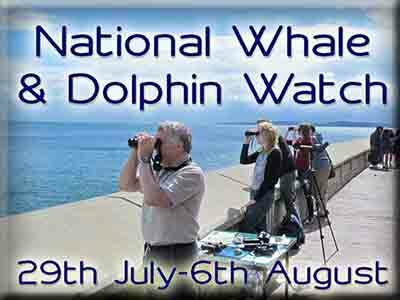 So, what is National Whale & Dolphin Watch really all about? Well, perhaps I should firstly ask the question – do you know how many cetacean species occur in UK waters? Some of you will know the answer to this, but the majority of folk in the UK will not be aware that we have 29 different species of whales and dolphins to boast about!! This is more than a quarter of the entire British mammal fauna! And did you know that during our annual event, we usually see a dozen or more of those species just in one week. Why do we run NWDW? Our biggest annual event is all about putting an allotted time aside (one week), to ask the public to help us spot as many different species around our coasts as possible. The results then give us a ‘snapshot’ of what exists in UK coastal waters. It gives the public a chance to join an organised group near them where they can learn more about these species, how they are doing, how to be more successful at spotting them, and how they can get further involved. For those of you who love the ocean and are lucky enough to spend time enjoying everything it offers – coastal walks, sailing, swimming, beach holidays, etc, you might like to add another activity to your list…cetacean spotting!! During a cliff-top walk why not take a pair of binoculars with you and spend just half an hour scanning the water for signs of cetacean life. We think NWDW inspires people to give it a go. The public should understand that they too can see wild whales and dolphins, and can contribute to our database. We are encouraging ALL to get involved. It doesn’t matter if this is your very first visit to the coast, we’d love to see you! The more the merrier, families too. Why not turn it into a family holiday!